Hi friends and happy almost Friday to you! You'll be glad to know that my love affair with mint is still going strong! Especially when paired with peach and gold tones like this. If you're looking for a romantic palette that will work for Spring or Summer, then perhaps you should consider a color palette like this one. Elegant and oh-so sweet, these colors were just made to go hand in hand. Want to know what I love most about this lovely little palette? Goodness, it's definitely a toss up between those darling bridesmaid dresses and this gorgeous place setting! What can I say? I'm totally head over heels for Mint. So what do you think? Are you seeing the party planning possibilities with these colors? 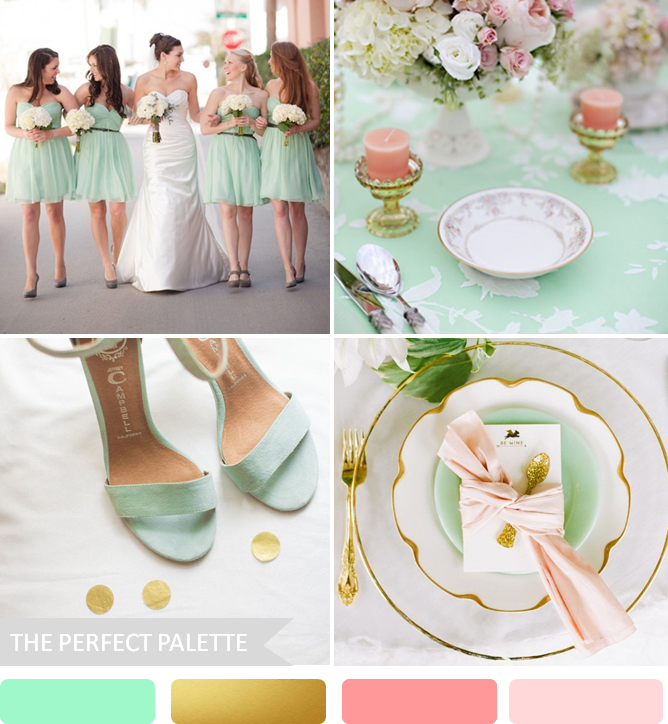 10 Comments " Party Palette | Mint, Peach and Antique Gold "
Such a perfect party color combo! Adore this palette for a springtime wedding! Such a lovely, romantic palette! I'm definitely with you and still on a huge mint kick! I'll never tire of it! I have a reader request and a friend who I'm helping find bridesmaid dresses, and they are using this color scheme! This is gorgeous! And how cute is that little glittery spoon? I don't think I'll ever tire of mint! This is hands down the most perfect palette for a romantic spring wedding! I LOVE it!